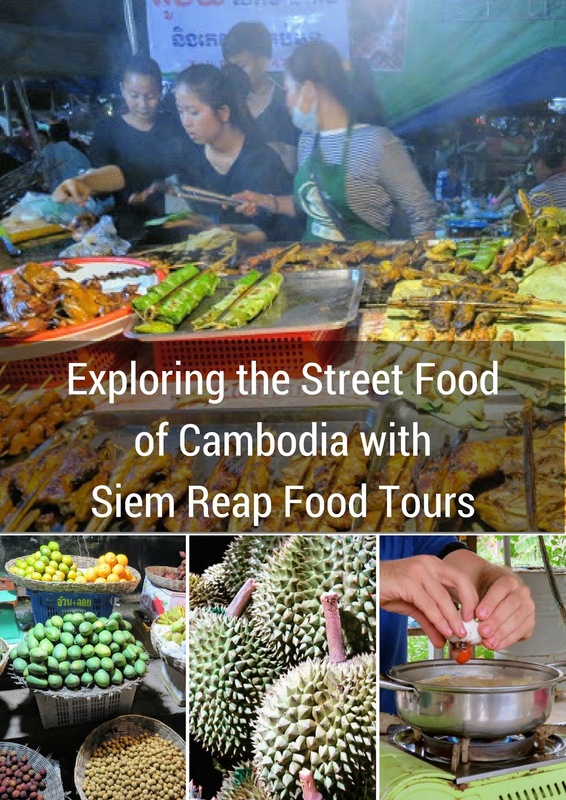 We discovered Siem Reap Food Tours, a company run by westerners living in Cambodia and signed up for their evening Cambodian street food tour. Food memories always linger the longest for us and we knew the famous food in Siem Reap would definitely offer opportunities to tickle our taste buds. Sometimes in less developed destinations, it can be difficult to figure out which places are hygienic and less likely to upset a sensitive western stomach. Our answer is to take a street food tour when the opportunity arises. We were excited to board a Siem Reap Food Tours’ tuk tuk and sample Siem Reap street food by night. Siem Reap Food Tours is led by Steven, a Scotsman and former chef who has been living in Cambodia for several years. Steven is fluent in Cambodian and has sought out Siem Reap's hidden secrets. Steven takes his visitors to the local places with the freshest ingredients and unique dishes prepared under hygienic conditions. All Aboard Our Tuk Tuk for Siem Reap Street Food by Night! Getting to sample local delicacies on a Siem Reap food tour was appealing but we were even more excited by our mode of transportation. The four tour group participants piled into a tuk tuk. Steven sat up front next to the driver on the back of his motorcycle. We must have been quite a sight. I'm impressed that the tuk tuk was able to pull all our weight especially after we'd eaten our fill at several stops along the way. At our first stop, we sampled Muscovy Duck Soup. The proprietors brought out a hot pot filled with a spicy looking broth. Steven brought it to a boil and then added a balut (fertilized duck egg) to the soup. Our Siem Reap food tour was off to an adventurous start! We put fresh greens in our bowl and Steven ladled in some broth. None of us was brave enough to eat the balut that was cooked in the soup (aside from the blood now flavoring the broth) but Steven took care of that and polished it off himself. Our next stop was a small restaurant run by a local family with several adorable children. Meat was grilling on the barbecue. We sampled another popular Siem Reap street food dish called pig face which was served with an amazing peanut sauce and spicy chilies. For the third stop on our Siem Reap Food Tour, we drove a little further afield to a restaurant on the outskirts of town. We were led into a thatched cottage and arranged ourselves on the ground around a small table. A dog hoping to earn a few scraps waited patiently outside the hut. We enjoyed fried fish in a curry broth with water mimosa and green mango salad. Everything was served on communal platters. Siem Reap Hidden Secrets: How to Select a Durian! 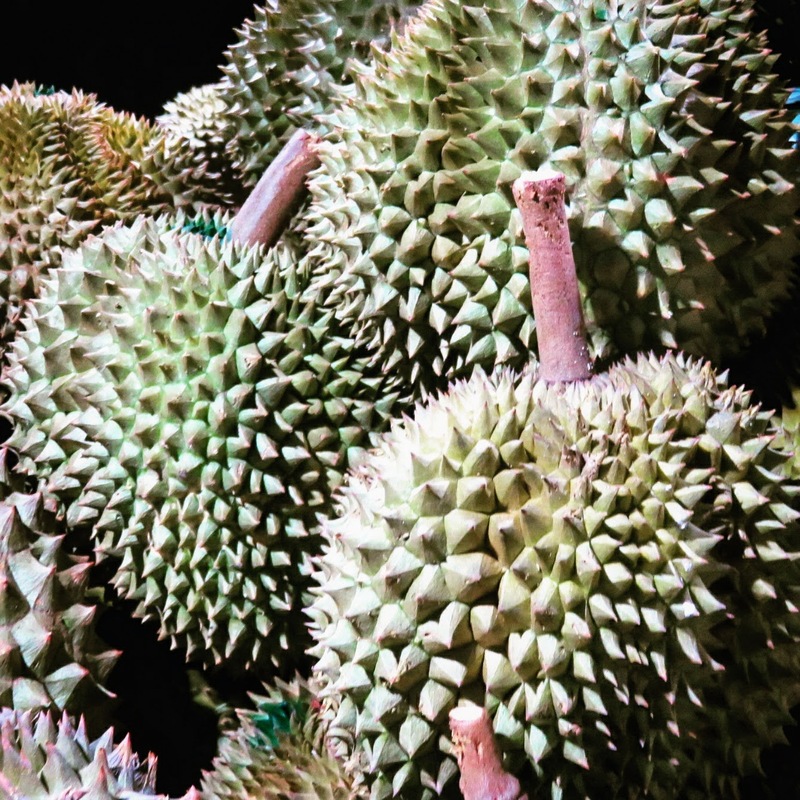 Durian is abundant in Cambodia and is one of those foods that is endlessly intriguing. It's supposed to taste sweet and delicious but comes at a cost. Durians often smell incredibly stinky. In fact, in many places we visited in Southeast Asia, we saw 'No Durian' signs in public places. The smell can really be a menace. Steven assured us that it's only over-ripe durians that are the problem. If you find one that's perfectly ripe, you get all the flavor and none of the stink. Our tuk tuk rocked up to a mobile cart selling piles of durians. After careful inspection, Steven selected a durian and the lady working in the cart cut it up into pieces for us to eat at the night market. The durian was sweet and creamy but I didn't care for the texture which reminded me of a mushy banana. I'm glad I tried durian on our Siem Reap Food Tour but I probably won't go out of my way to eat it again. We find night markets to be especially intimidating when we travel independently. They are typically really crowded and chaotic and it's never clear what the rules of engagement are. We really appreciated going to the Psa Plaew 60 Night Market with Siem Reap Food Tours. Steven, the ultimate Siem Reap food guide, led us every step of the way. Steven ordered pork ribs, chicken legs and frogs stuffed with pork and spices from a local BBQ place at the night market. He instructed us to take off our shoes as we staked out a spot for an evening picnic on the platform behind the street food vendors. We were surrounded by Cambodians out for an evening of entertainment and shopping. We picked out koey and lychees as a sweet treat to accompany our barbecue Siem Reap street food feast. The barbecue was served with sweet chili sauce and a salt and pepper lime rub. So good! We never would have managed to order this awesome Cambodian street food meal on our own. We stopped for Pa'hem (aka dessert) which literally translates as 'sweet'. Our mound of crushed ice was filled with sticky rice, coconut milk custard and small cakes made from duck egg yolk, sugar and flour. It was especially entertaining to watch an older lady bantering with our food guide, Steven, in Cambodian. 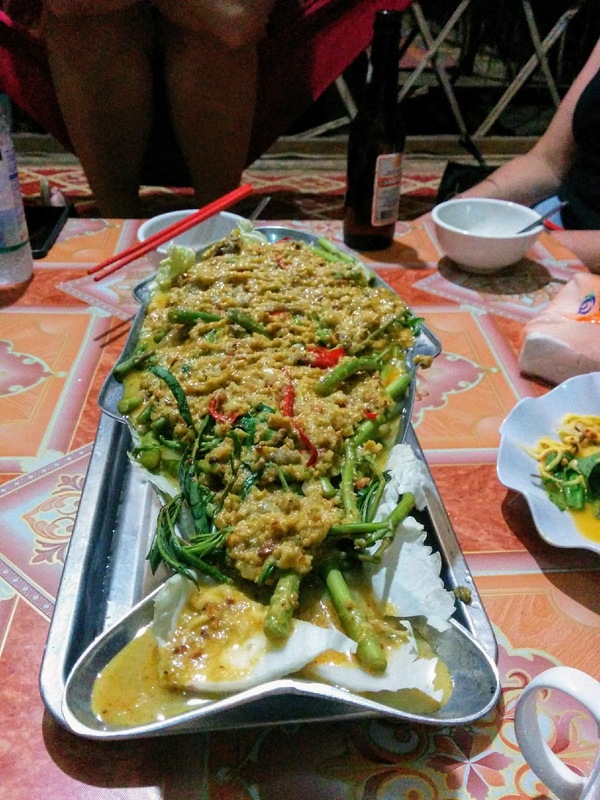 Did the Siem Reap Street Food Agree With Us? One question that I always ask when planning a street food tour but very rarely find an answer to is whether the food caused any issues for a sensitive western stomach. In this case, I'm happy to report that Siem Reap Food Tours took us to all the right places and there were no digestive repercussions from our visit to any of the food stalls. I ate pretty much everything put in front of me. I did go easy on the raw greens that accompanied the pig face but didn't abstain entirely. 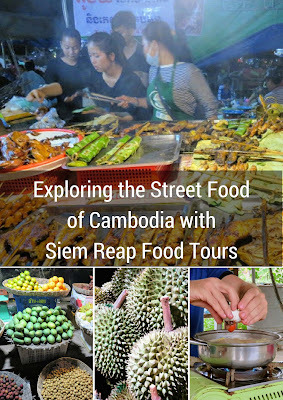 Siem Reap Food Tours has got your back in picking the right places to safely sample local street food in Cambodia. Our tour of Siem Reap street food by night with Siem Reap Food Tours cost $75 USD per person at the time of writing. Our Cambodian street food adventure lasted about four hours. Make sure to wear plenty of DEET to protect yourself from mosquitoes and other insects since the tour is mostly outdoors after dark. Try Siem Reap street food by night with Siem Reap Food Tours. Find out about famous foods to sample in Siem Reap during your visit to Cambodia and Siem Reap hidden secrets that you might not uncover on your own.